Dinner at Archetype with a nice Goldeneye pinot. Since I have been back in Saint Helena for 2 days after being stuck in the mountains for a month, I have been eating my way through town. One of my favorite dishes is duck breast and one of my favorite preparations for duck breast is at the restaurant Archetype at the north end of Saint Helena. I’m fairly new to duck. I had never tried duck until we moved to the Napa Valley. Phoenix isn’t exactly a culinary hub for fine dining. When I tried it on a whim, I realized it could possibly be one of my favorite and versatile proteins. I usually prefer the leaner duck breast to duck confit (with exception of the duck confit risotto that Tra Vigne used to have). 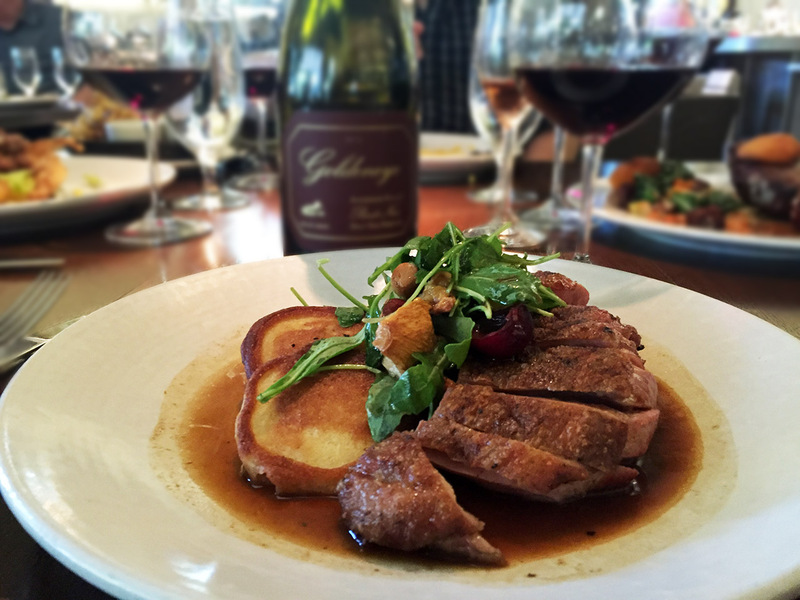 Since duck goes well with lighter reds, I chose to bring the 2012 Goldeneye Anderson Valley Pinot Noir Split Rail Vineyard. It’s still bolder for a pinot but I figured it would pair nicely with the duck. Usually, when I go to Archetype, I sit at the bar for happy hour. They have a great happy hour and it lasts an hour longer than most in town (5pm-7pm). Instead we reserved a dining table at 6pm and chose to eat inside rather than the screened patio. The restaurant has a nice farmhouse feel in the decor with a hint of a Cape cod feel. We decided to order drinks while the pinot noir chilled. I asked what corkage was for locals and the waiter replied “25 dollars”. This seemed very pricey based on the fact that there are about 10 restaurants in town with free corkage for locals. Since I usually sit at the bar, I didn’t realize that this was the case. I probably won’t bring another bottle in. I ordered a Kir Royal. They didn’t have the classic Creme de Cassis and they also use Prosecco instead of champagne (or sparkling wine if you’re not in France). My husband ordered a classic Manhattan which is one of his favorites. 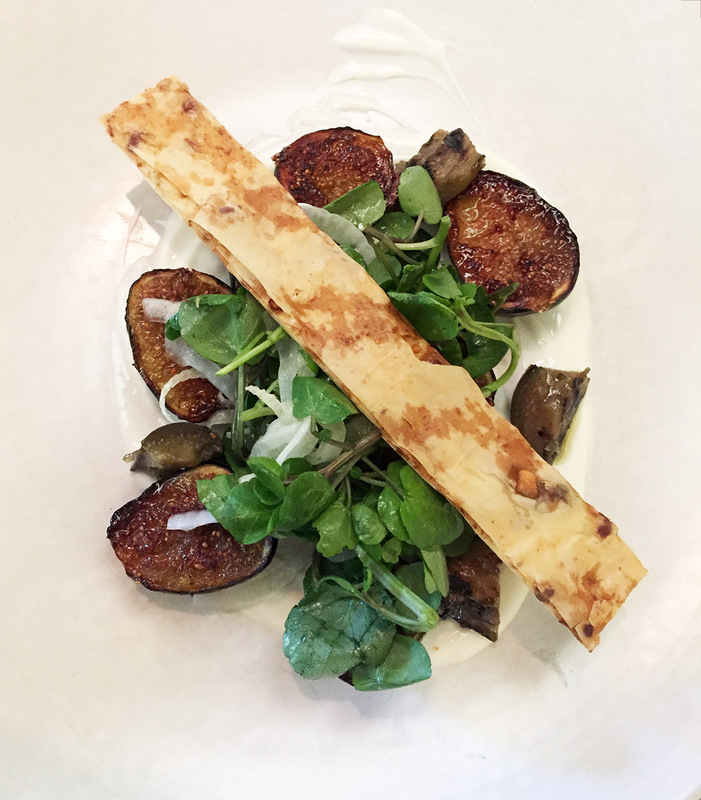 We decided to order a starter and we selected the Roasted Fig Salad from the Spring Harvest section of the menu. Our starter arrived at the table very quickly. It was plated beautifully. On the bottom of the plate was a blood orange yogurt base topped with black mission figs, eggplant, watercress and a pistachio baklava (unfortunately I can’t have the pistachio baklava so we had them put it on the side. I did add it back for the photo.) The eggplant and the figs were a nice contrast. I’m not really a big eggplant person but this was really rich and meaty with a smokey undertone. The figs were bright and acidic with a nice sweetness and the yogurt added a nice creamy taste to the dish. The watercress added a tangy crunch. I would highly recommend this salad as a starter. It would have been nice to try the Goldeneye Pinot with the salad to see how things would have paired up. 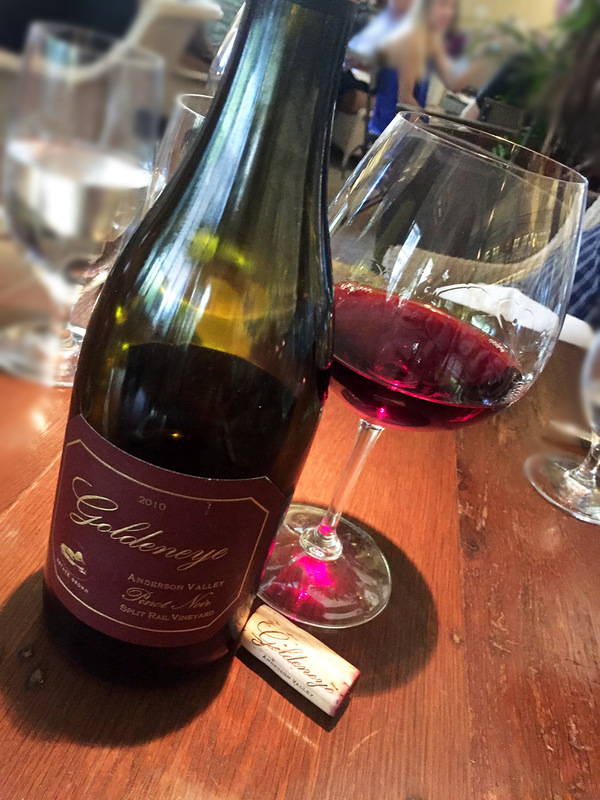 Next came the 2012 Goldeneye Pinot. Goldeneye is located in Anderson Valley, north of Napa about 2 hours. It is known for its pinot noirs. Goldeneye is by far one of my favorite pinots and its sister vineyards, Duckhorn and Paraduxx, are located in Napa Valley. You can try Goldeneye wines at Duckhorn if you don’t want to make the long winding trek to Anderson Valley. The Split Rail Vineyard Pinot is relatively new to the Goldeneye Portfolio. It spans both the warmer and cooler sections of the valley so the flavor profile is broad. Goldeneye states flavors of black tea, dark fruit and berries, black pepper, herbal spice and root beer. I probably should have cellared it a few more years but I was eager to taste a single vineyard Goldeneye since they usually go straight to the cellar for an extensive amount of time. When the waiter opened it and poured the first taste, it had that distinct funk that you get in a heavier pinot noir. It had a lot of dark fruit and and berry notes. Unfortunately this could have sat for a few more years before it would hit its peak and my impatience in opening it showed a high level of acidity . It was still a very vibrant wine. My dinner consisted of Liberty Farms duck breast, corn griddle cakes, preserved chanterelle mushrooms and a cherry salad. The duck was cooked a perfect medium rare and the maple flavor on the griddle cakes with corn complemented the duck nicely. I could have easily eaten this for breakfast. The cherries gave it the sweet and sour aspect that worked in harmony with the dish but probably overpowered the wine in general. If you are going to pair a wine with a dish that you have had many times, it is good to keep in mind every ingredient that is in the dish. It only took a couple cherries in the entrée to change the flavor profile of the wine. I think that the cherries coupled with the young pinot made this an okay but not optimal pairing. Food and cocktails are amazing at Archetype. And, while I feel like the under-staffing needs to be addressed and there should be at least a discount for locals on corkage, the elevated dishes and cocktails make this a must try in Saint Helena.